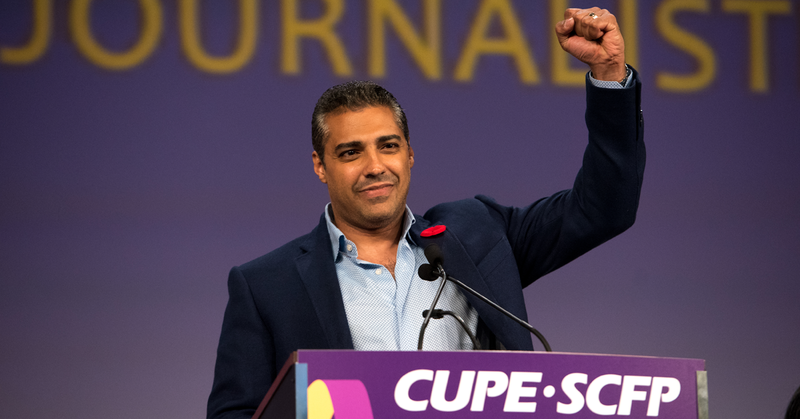 Convention delegates gave former Al Jazeera Cairo bureau chief and award winning Canadian journalist Mohamed Fahmy a hero’s welcome on Thursday as he delivered one of his first major addresses since being pardoned by Egyptian President of the bogus charges that saw him imprisoned for more than 400 days. Fahmy thanked CUPE and National President Paul Moist for CUPE’s efforts to help him win his release, and said the worldwide movement to support him was key to his pardon and return to Canada. While Fahmy was awaiting his retrial in Cairo he and his wife Marwa Omara established the Fahmy Foundation. The Foundation’s purpose is to champion free speech and fight the suppression of the press and to advocate for the more than 200 journalists currently imprisoned by regressive governments around the world. For more information on the Fahmy Foundation, visit www.fahmyfoundation.com.